The standard approach to the legal foundations of corporate governance is based on the view that corporate law promotes separation of ownership and control by protecting non-controlling shareholders from expropriation. This book takes a broader perspective by showing that investor protection is a necessary, but not sufficient, legal condition for the efficient separation of ownership and control. Supporting the control powers of managers or controlling shareholders is as important as protecting investors from the abuse of these powers. 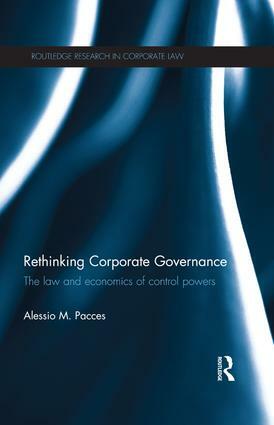 Rethinking Corporate Governance reappraises the existing framework for the economic analysis of corporate law based on three categories of private benefits of control. Some of these benefits are not necessarily bad for corporate governance. The areas of law mainly affecting private benefits of control – including the distribution of corporate powers, self-dealing, and takeover regulation – are analyzed in five jurisdictions, namely the US, the UK, Italy, Sweden, and the Netherlands. Not only does this approach to corporate law explain separation of ownership and control better than just investor protection; it also suggests that the law can improve the efficiency of corporate governance by allowing non-controlling shareholders to be less powerful.